Don’t let a faulty boiler put your home at a disadvantage. Make sure you schedule regular boiler servicing for maximum system efficiency. Call your London boiler servicing experts on 020 7060 4770 and enjoy quality tune-ups that can help you avoid stress and hassle down the road. Your boiler should be serviced every year, ideally, to keep it working in top condition. Annual maintenance is a hassle-free job that helps you avoid the possibility of emergency breakdowns and callouts in the middle of winter, when heating engineers are in greater demand. Regular servicing also ensures that the boiler is running safely and efficiently, which means greater savings for you—no unexpected replacements or problems that can set you back. All major manufacturers recommend annual servicing and may actually require this for their warranties to remain valid. 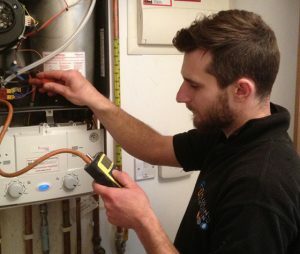 We suggest you call us and have your boiler serviced during the Spring or Summer, every year. Between April and September is ideal. We can even set up an annual reminder for you on our system, after which we will call you every year at the same time and arrange to come back and carry out the service again. As well as being Gas Safe registered, we are accredited installers for almost all major boiler manufacturers. We are familiar with the latest models and will have your boiler running safe and smooth. Upfront, flat-rate charges so you don’t have to worry about any surprises after the job. How much do we charge to service your boiler? Easy. It’s a flat charge of £90+VAT. What will our engineer do during boiler servicing? We perform a gas pressure check to make sure that the pressure at which your boiler is operating is correct. We test that all the major components are working as they should and adjust if necessary. We test that the boiler is burning correctly and efficiently using a flue gas analysis. We test the boiler’s flue and check that the boiler is not emitting any harmful gas. We check your controls to make sure everything is working exactly as it should be. We check carefully by eye for any signs of corrosion and leakage. We give you a Service Certificate that shows the checks we have carried out. You should keep this in case you ever wish to make claim on your boiler’s warranty and need to demonstrate that you have serviced the boiler regularly by a qualified engineer. Our boiler services present you with a Service Certificate that allows you to claim warranties on your unit without hassle. If you would like to have your boiler serviced call us on 0207 060 4770 today in London, and we will send one of our Gas Safe experts to complete this for you without hassle.